Wow Peter that is a great piece. It's a shame it didn't get used. 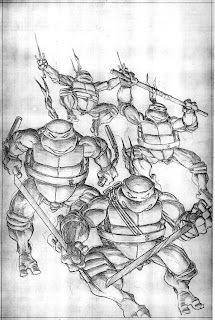 Is there any chance you and the gang at Mirage would put together a complete TMNT artbook? I know I'm not alone in wanting one. Yes, I too have mentioned an art-of book on more than one occasion... it would be awesome to have that. Great drawing Peter, this is one of my favorites I think! LOVE these sketches and stories behind them. Interesting stuff almost like a parallel universe of what might have been. -->> ..there's no reason for this to be lyin' around. There needs to be some art book, or at least have this used as pin-up/back cover work on Tales. I'm kind of glad we get to see it in this state, the shading in it is awesome. Inking and colouring would have lessened it's impact. Oh I would be first in line for an artbook. Awesome problem solving in with the blue pencils. Very Donny-thinking. LOL or maybe Donny just does a lot of peter-thinking.